Oral mucosa - Necrosis in a male F344/N rat from a subchronic study. There is necrosis of the epithelium on the hard palate (arrow). Oral mucosa - Necrosis in a male F344/N rat from a subchronic study (higher magnification of Figure 1). 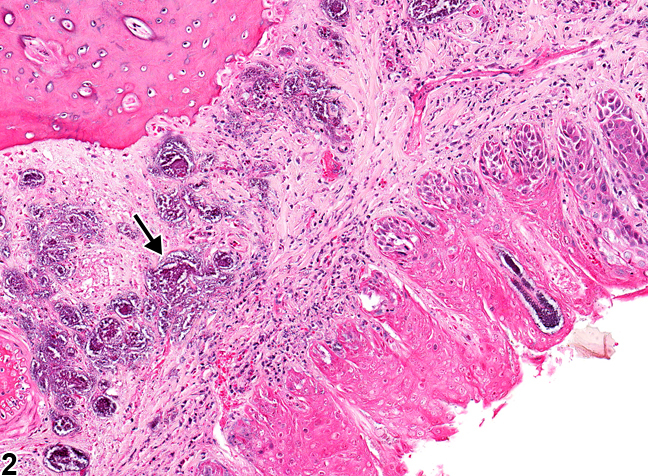 There is necrosis of the epithelium on the hard palate mucosa, with bacterial colonies in the submucosa (arrow). Mucosal necrosis in the oral cavity can be a treatment-related effect but is more commonly caused by trauma due to the gavage procedure and/or the presence of foreign bodies (hair shafts, food material). 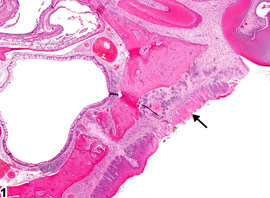 The traumatized area can undergo necrosis and ulceration, resulting in suppurative or chronic active inflammation and granulation tissue formation. If the necrosis is deep to the surface and does not appear to be part of an ulcer, or there is no loss of epithelial cells, then the lesion is considered necrosis rather than an erosion or an ulcer. Infection with Actinomyces species can result in deep infection and necrosis. Inflammation and necrosis of gingiva may also occur around the incisor teeth. 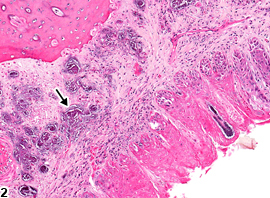 Necrosis of epithelium is diagnosed instead of erosion or ulcer if the necrotic epithelium is still present and at least partially attached to the underlying lamina propria or if the necrosis involves more than just the epithelium (i.e., also or primarily involves the underlying connective tissue or bone). If the necrosis is consistent with ischemia secondary to thrombosis (infarction), the narrative should so state, even if the thrombus is not in the plane of the section. Severity grading would depend on the overall size of the lesion and number of areas affected. While hemorrhage, edema, fibrosis, or inflammation may be associated with necrosis, these are recorded separately only if they are a prominent component of a necrotic lesion, but they can be described in the narrative.